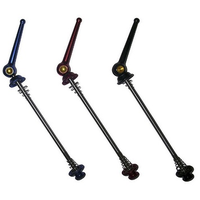 The PZ Racing CR3.1 Q Carbon Fiber/CrMo Quick Release Skewers are made with CrMo axles, and carbon fiber levers. This makes them extremely light and strong. Sold as a pair for either your Road or MTB.